Madeleine Turgeon is a multidisciplinary artist working in the visual arts since 1995. Born in Montreal in 1961, she grew up in Rougemont but set up her studio in Saint-Lazare, a country town known for its greeness. After initially studying agricultural sciences at McGill University, she went on to visual arts studies at the Ontario College of Art & Design University in Toronto. As nothing is lost and all is created... she abandoned agricultural sciences in 1988 to devote herself fully to an artistic career, while keeping the passion for nature that inspires her. Alongside her creative work, she worked in the graphics and communications world for several graphic art agencies in Ontario, Alberta and Quebec. Graphics enabled her to deepen her grasp of the art of visual communication by adding forceful imagery to the power of words, combining technical expertise with the rigour of digital art. 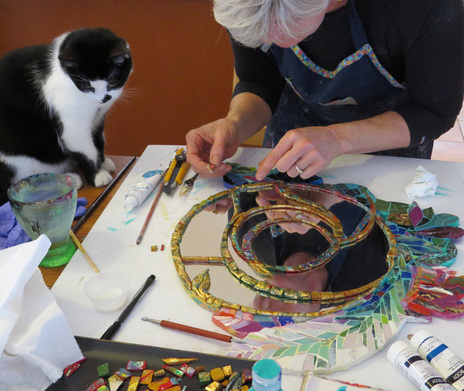 Enriched by much travel and study abroad, Madeleine Turgeon developed a unique style and also gained the fluency and spontaneity that allow her to explore mixed media painting and mosaic with equal facility and sensitivity. Her artistic journey has been marked by numerous group and solo exhibitions. She is the recipient of many visual arts awards and her works enjoy national exposure in many galleries for the enjoyment of private collectors and the public. She was honoured with the distinction of Academician by the Académie internationale des Beaux-Arts du Québec, selected by vote of her peers and the public, in recognition of her artistic approach and the quality of her visual work. As an artist, she is wholeheartedly committed to the cause of the visual arts and regularly sits on committees and juries in her field. She is involved with numerous causes related to the development of the visual arts, in particular at the Conseil des arts et de la culture de Vaudreuil-Soulanges (CACVS). She has also shared her experience in her role as commissioner for the Culture, Communications and Heritage Commission of the Conférence régionale des Élus de la Vallée du Haut-St-Laurent (CRÉVHSL). Co-founder of Autour de nous, a group of around twenty professional artists, she is the arts and logistics director of the organization. Since the founding of ADN in 2006, she has been president and exhibitions curator. She has also initiated various events in the visual arts, including Bicycle Path Works (Piste cyclable en œuvres), the Autour de nous Gallery, Art in the Vineyard (Art au vignoble) and many travelling exhibitions. After much groundwork, she conceived the Art-Affaires Circonflexe project to provide artistic services for companies and institutions, showcasing the group’s professional artists. Starting from the premise that personal balance is a value that we increasingly strive for, introducing art in companies and institutions has proven to be an effective managerial tool. Introducing art and creating collective works enables new values to emerge, boosts the overall performance of managers and employees and improves working conditions. Through her cultural mediation work in the business, justice, health and education sectors, she developed a strong interest in science of creativity, especially Creative Engineering®. Through her involvement in the Vallée du Haut-Saint-Laurent unit for innovation in cultural mediation, she humbly shares her expertise by mentoring emerging artists and advising many organizations. Recognized for her leadership and her creative mind, she gives presentations on Putting Ideas into Action (Passez de l’idée à l’acte), focusing on the creation of collective works.